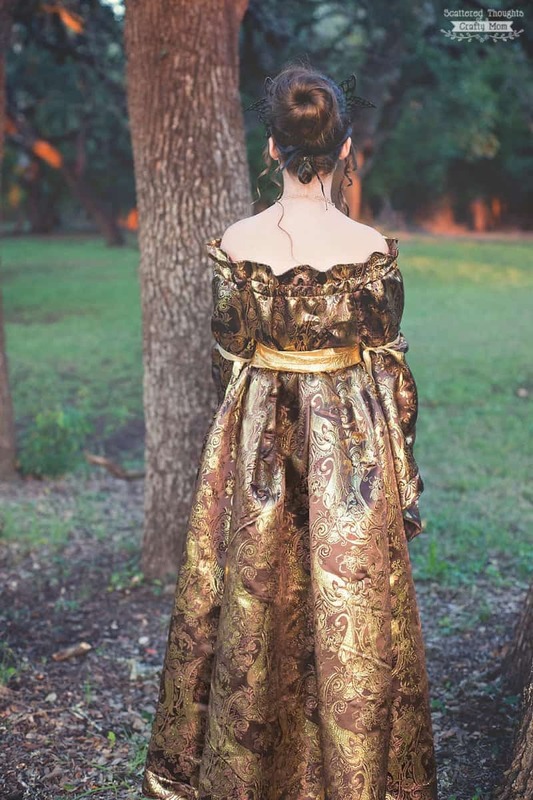 I encouraged her to go the route of a Medieval Princess /Renaisance Dress route for a couple of reasons. Number one, JOANN provided me with the fabric and supplies needed to make this dress. So, shout out to JOANN for being the destination for a handmade Halloween! 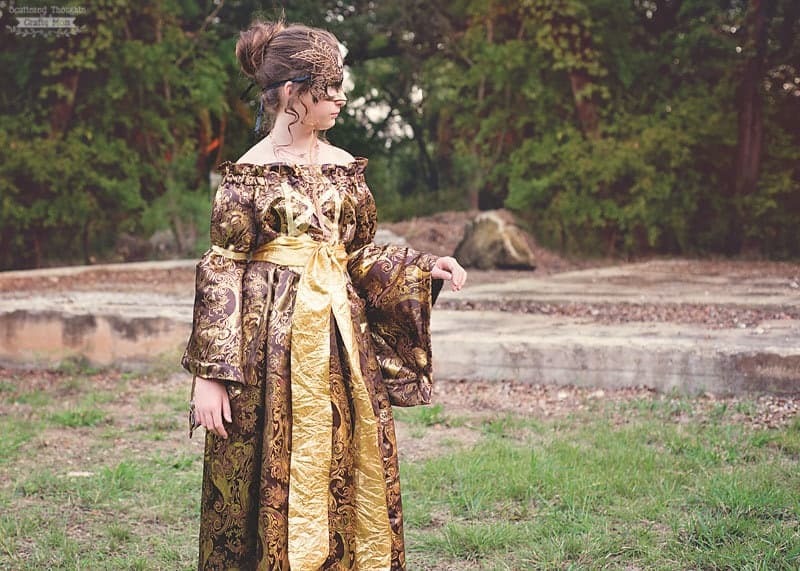 Number 2, I knew my peasant dress pattern would be perfect for a costume like this. 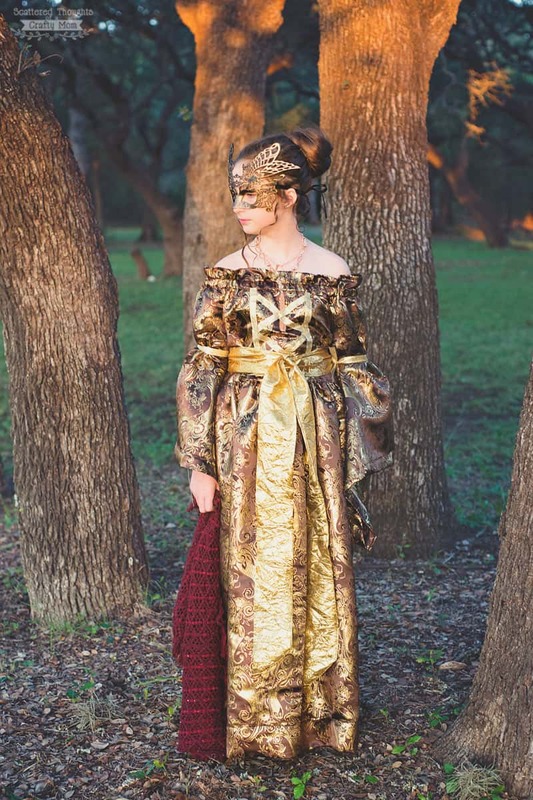 Love that pattern – it’s the absolute best for costumes. There are just so many ways to change it up! 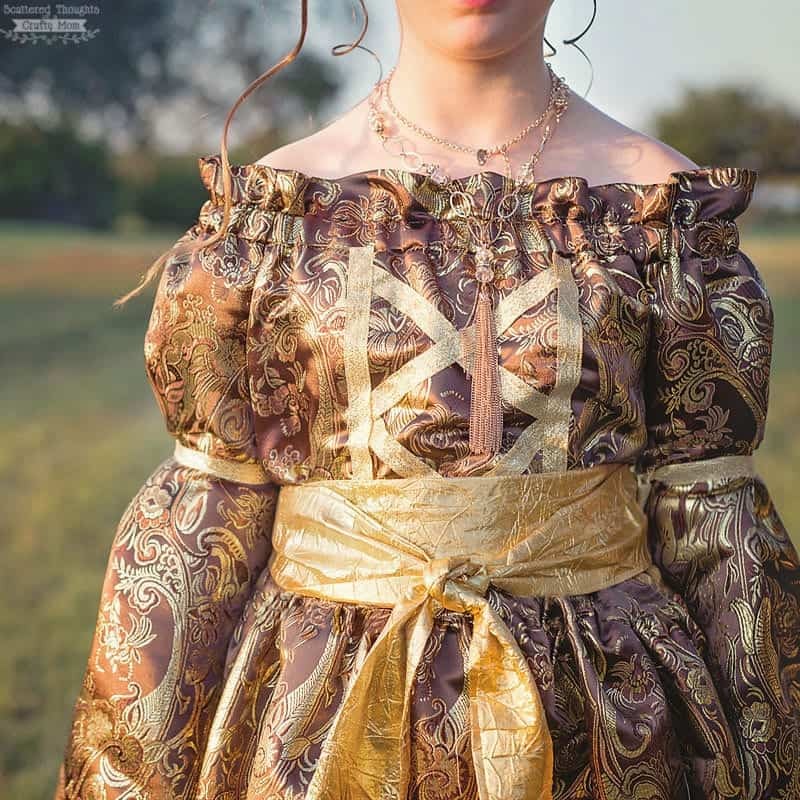 When we first tried on the mostly finished dress, the wide belt was making the dress look more like a silky kimono with an obi belt instead of a renaissance period dress, so I went back and added the ribbon trim (to look like lacing) to the front of the bodice. 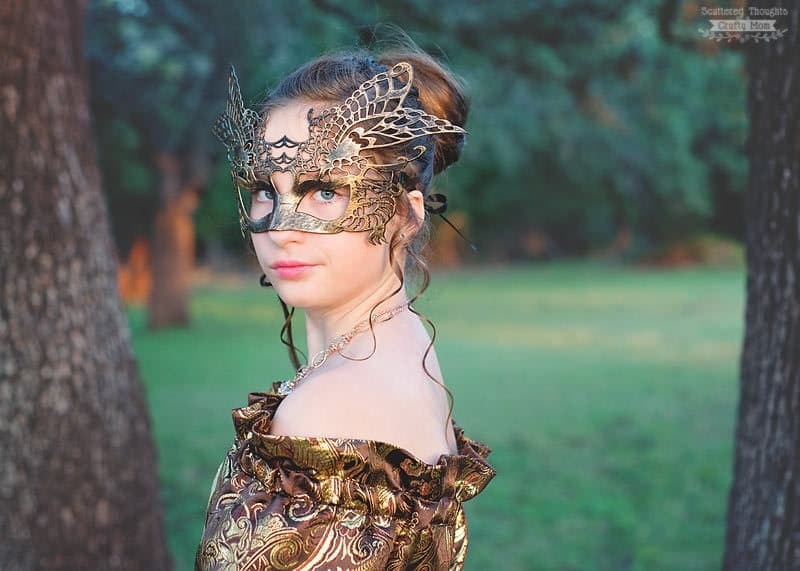 I ended up having to glue it on – it was impossible to sew it in place once the dress had been assembled. I’d actually planned on adding this detail from the first, but had forgotten the trim before assembling the dress. 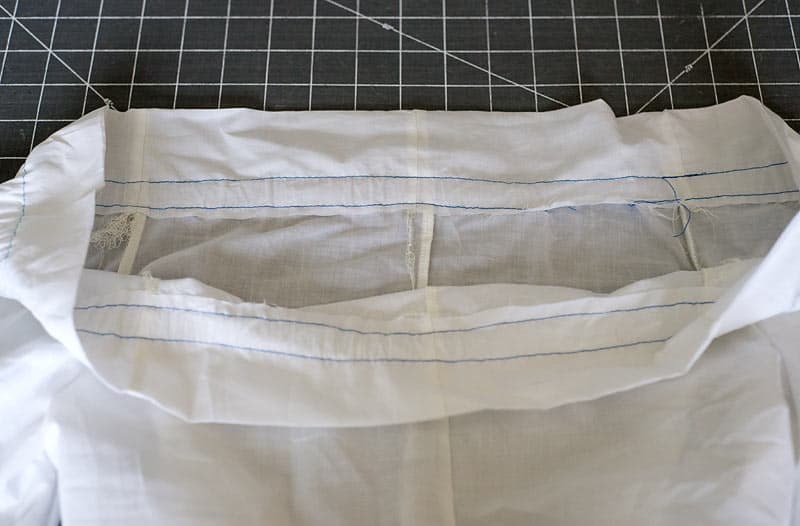 So if you do something like this, be sure to add the trim before adding the elastic and skirt. Someone was flying a drone around the park while we were trying to take these pictures… Half of the photos either had the drone in the shot or she was looking up at it! 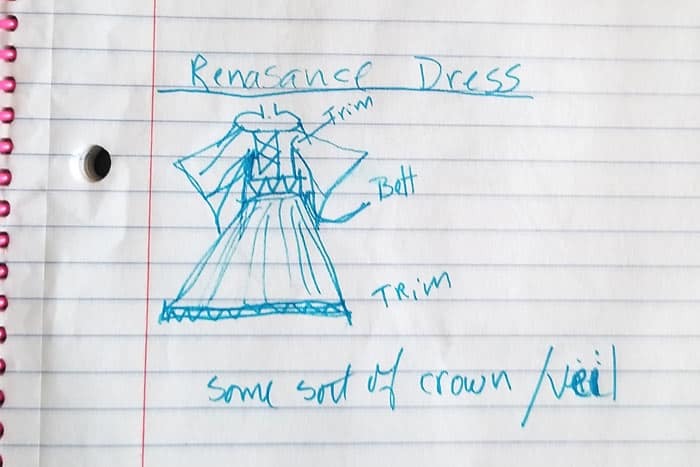 To make girl’s renaissance costume, print out the peasant dress pattern (found here) and follow the Modern Peasant Dress Tutorial with the following changes. 2. 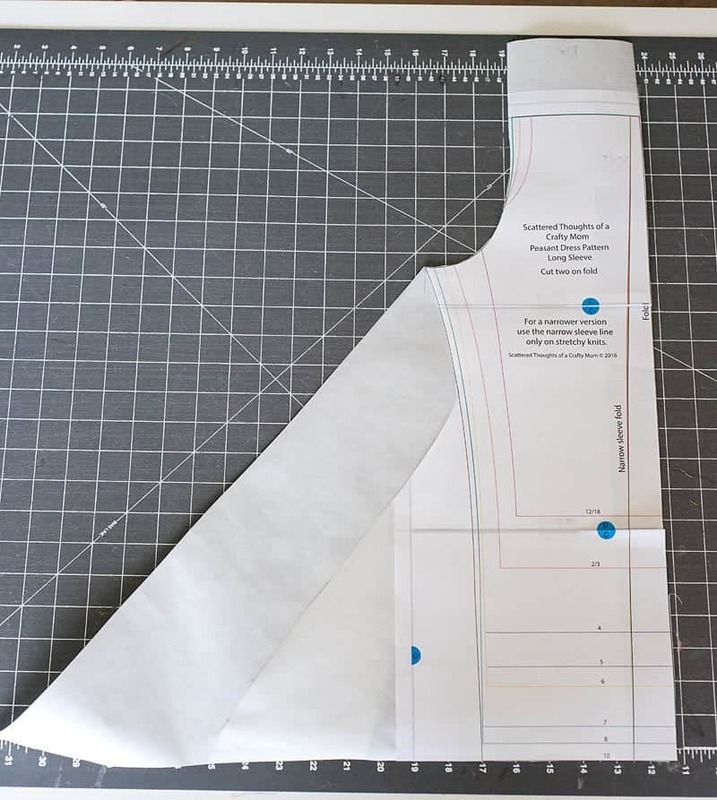 Extend the top of the sleeve and bodice pattern an extra 3 inches. Came out amazing, don’t you think? 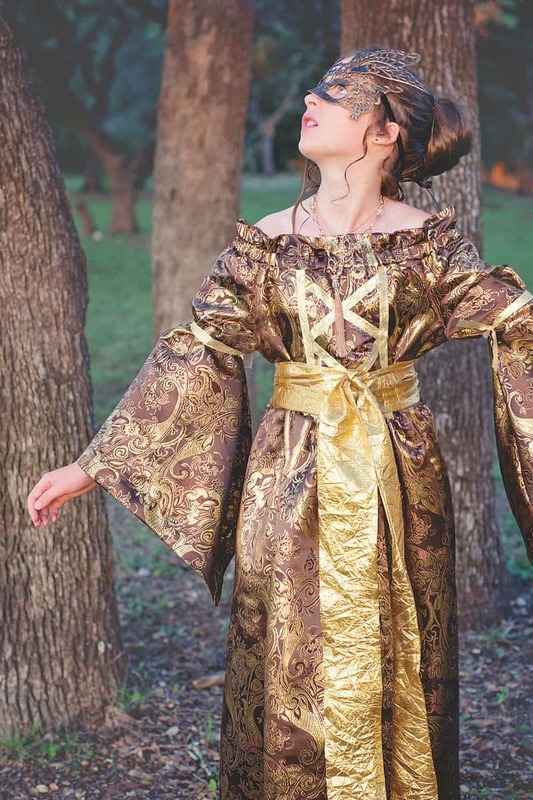 As an fyi on a few future patterns: I’ll be adding a size 12 to my peasant dress pattern soon. Also, the muslin of this bodice looked so amazing in white cotton. I need to work on the sleeve ends a bit (as is, the sleeves are a little too angled and wide) but I think I will try to have a new top pattern, based on this idea, done in time for the holidays. 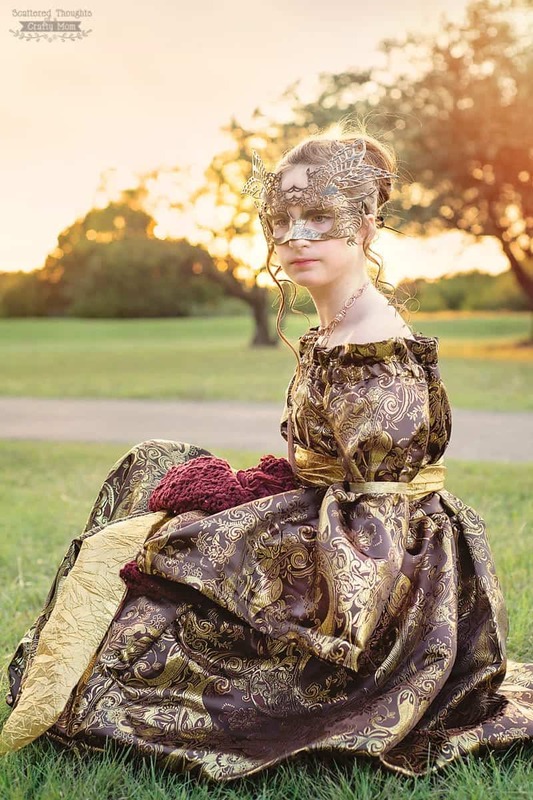 So, if you’re not already on my newsletter list, be sure to sign up here so you can be notified about pattern updates and changes. Turned out beautifully! Your daughter is certainly growing up. She looks great in her costume. Thank you for the great patterns. Thank you! She is definitely is, although some days she still acts like my sweet little baby. Omg this is beautiful. 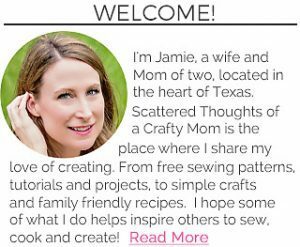 I love the way u use simple patterns and transform it to something way more beautiful and yes thank u soon much for sharing the amazing free patterns. Thanks, I do love that peasant dress pattern! Beautiful! She truly does look like a princess! Thanks for sharing. I love how it glistens. 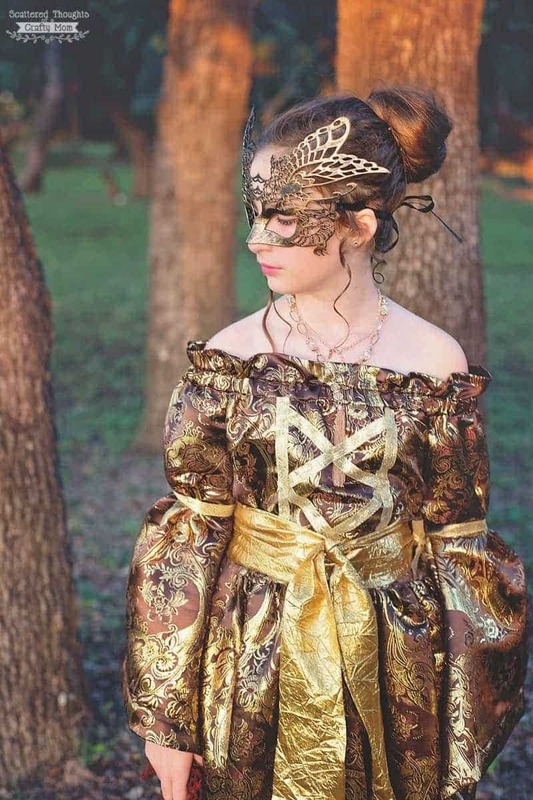 My daughter would want this costume.